I personally think Vegas is the type of town that grows on you. My first visit to Las Vegas was ok, but I didn't get all the hype that I saw everyone posting about, I truly thought it was a neat place, but give me a beach any day!! So when my sister decided her wedding location was going to be Vegas, I had mixed feelings about it. I needed to make this trip more fulfilling then the last. The first thing we did was ensure that we were not bringing children with us! Check, both kids were deposited at aunties houses for the week!! Grandma and Papa would check up on the lil one and my big son would be spending some time with his lil cousins. 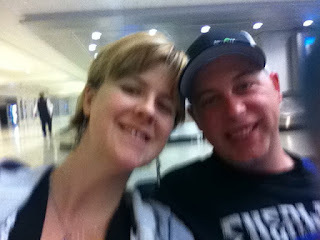 First hurdle solved, now just to figure out what Hubby and I would be doing in Vegas. Almost 5 years ago I lost my father. He had been battling heart and lung failure for ten years, had outlived the original prognosis from the doctors and had fought to get better. He had gotten better, in that he was able to leave the hospital, he was able to undergo some pretty significant surgeries and he was able to live a life similar to the one he had lost, but in many ways that first illness had taken from me the father I knew all my life growing up. In the last year of his life I did see that man come back, he had let go of some of his bitterness, he had accepted things as they were, not for what he felt they should have been. Every day I miss him, and wish he hadn't left this world, I know that he is no longer in pain and that he is in a better place with my nana and his dad. For the 19th week of this photo challenge we had to find the drama. I personally like to keep my life fairly drama free so I wasn't sure where I would find drama, at least, not what I would classify as drama. We had a family type reunion, and well family always brings about some drama so here are some pictures of our family trip to the Calgary zoo to see the penguins and other animals. Week 18 was perspective. There was talk about us all trying to take a picture of the same subject, but as we all live in different areas of the province this was not really possible. But I found some interesting subjects to choose for this week. One was a picture of my sister on her wedding day, she looked so pretty, and I love the silhouette picture I was able to capture. The other was of a sign I had seen in one of the bars in Carlos and Charlies. It was so fun and had everything to do with perspective, not even how I saw things, but how others see and value things.